This exercise asks that the student read and reflect upon Liz Jobey’s essay on Diane Arbus in Singular Images: Essays on Remarkable Photographs by Sophie Howarth. “The fictions we make about photographs are as unreliable as they are unavoidable” (Jobey 2005, p.67). This is Liz Jobey’s opening line and the sentiment on which her essay is hinged. Using Diane Arbus’ 1966 photograph (A young Brooklyn family going for a Sunday outing, N.Y.C. 1966), Jobey demonstrates the ability photography has in convincing us of a narrative, which may or may not be true. Under the guise of curiosity Jobey fires a barrage of questions, which illustrate only the probability of a future “doomed existence” for the “blue-collar couple” (Jobey 2005, p.67). Analyzing the photograph, Jobey takes us step by step through the image’s signified, to reveal the symbolic message. The symbolic message is one of “disappointment. They look, or their marriage looks, already exhausted” (Jobey 2005, p.68). When first publishing the image, Diane Arbus applied ‘anchorage’ text to ensure the viewer was judgemental and steered towards a meaning similar to that as described by Jobey. Arbus intended the text to read, “they were undeniably close in a painful sort of way” (Arbus), enhancing a feeling of doom, and presenting the impossibility of genuine closeness. Peter Crookston, deputy editor of The Sunday Times colour magazine, modified the accompanying text, thus softening it, for a more sentimental and compassionate response in the reader. It seems to me that Crookston overstepped the mark, as his interventions were enough to completely change how the image was read. Crookston’s interventions drew on the viewer’s heartstrings while the message Arbus presented was one of doubt, questioning the family’s future and indeed the reliability of the American dream. Annoyed, Arbus complained in writing, suggesting, “next time let me write it so it makes more sense” (Arbus). Throughout Jobey’s essay, there is the lingering question, “why do we assume they are victims at all?” (Jobey 2005, p.67). The answer to this question lies in several factors. Firstly, the symbolic message as described by Jobey, builds a picture of tension and struggle. Secondly, whether it be as Arbus intended or Crookston’s modification, both texts deliver a linguistic message which serves to compound the family’s victim status as created in the image itself. Finally, by the time the photograph in question appeared in The Sunday Times, Arbus was already known for photographs of people living on the “margins of society because of their physical or mental or sexual difference” (Jobey 2005, p.69). Being known to photograph “freaks” (Arbus) probably strengthened the bias for Arbus’ photograph to be read as it has. Arbus’ privileged upbringing had her believe she “never felt adversity” and photography became a “means of escape” (Arbus). Sontag described Arbus’ fascination with freaks as venting “her frustrations at being safe” (Sontag 1977, p.44). While John Szarkowski believed her images revealed “no less than the unique private lives of those she photographed” (Howarth 2005, p.72). In photographing peoples’ flaws, Arbus was essentially capturing “the gap between intention and effect”, or the “point between what you want people to know about you and what you can’t help people knowing about you” (Arbus). What’s disturbing about the Brooklyn family photograph is that they appear as if ambushed or cornered, “whether out of politeness, or by their own vanity, into agreeing to something that is out of their control” (Jobey 2005, p.72). While the image appears to be a fleeting or chance encounter, Jobey describes a second photograph of this family which became available through a major retrospective of Arbus’ work by the San Francisco Museum of Modern Art. The retrospective revealed “plenty of instances where she returned to photograph again” (Jobey 2005, p.75). The second photograph features the family dressed the same as the first, sitting on a sofa in a sitting room. Their demeanor is much like the first photograph, a book on a shelf reveals the title, Ideal Marriage. This second image raises a whole new set of questions, regarding the timeline of the two photographs. Arbus must have established a level of rapport with the family in order to gain access to their home. Did the book on the shelf appear by chance or was it introduced by Arbus. If the book was introduced or at least re-positioned, does that mean that the first photograph may have then been more staged that was originally believed? Does that matter? I don’t believe it does. What’s important is that Diane Arbus presented us with a photograph that questions the values that we consider normal and acceptable. The photographs Arbus made, ultimately “turned normalcy on it’s head, making the ordinary bizarre and naturalizing the unusual” (Warner Marien 2010, p.352). I believe Liz Jobey’s essay to be a fascinating and comprehensive analysis of the Brooklyn photograph. Jobey gave great insight into the contribution Diane Arbus made to photography, and indeed the contribution her photographs have made towards a more open and accepting society. Returning to Jobey’s opening line, and reading it while considering the uncertainty which surrounds the photograph of the young Brooklyn family, I can only agree that“the fictions we make about photographs are as unreliable as they are unavoidable” (Jobey 2005, p.67). Badger, G. (2007) The Genius of Photography: How photography has changed our lives, London: Quadrille. 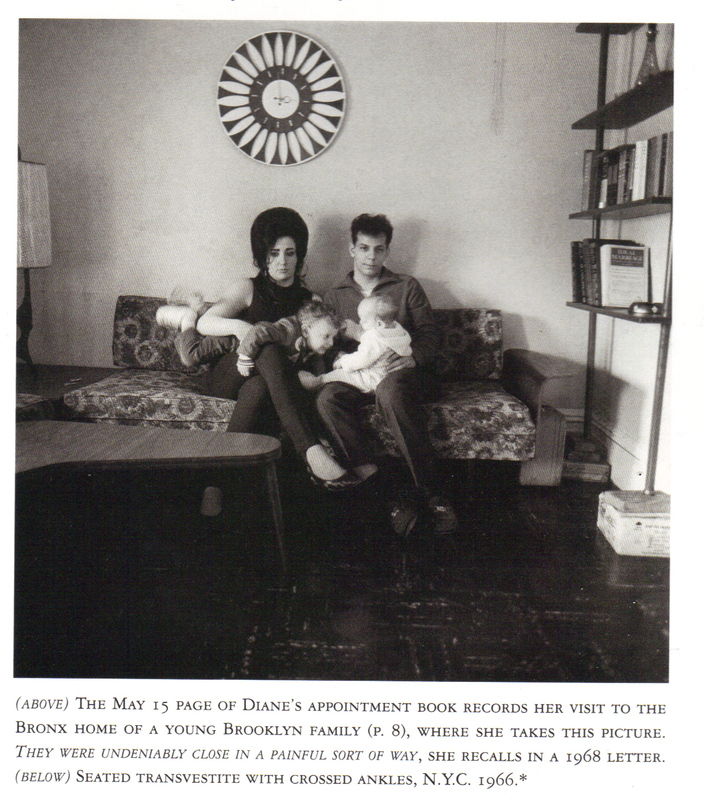 Jobey, L. (2005) ‘Diane Arbus: A young Brooklyn family going for a Sunday outing, N.Y.C. 1966’, in Howarth, S., ed., Singular Images: Essays on Remarkable Photographs, London: Tate Publishing, 67-76. Sontag, S. (1977) On Photography, London: Penguin.